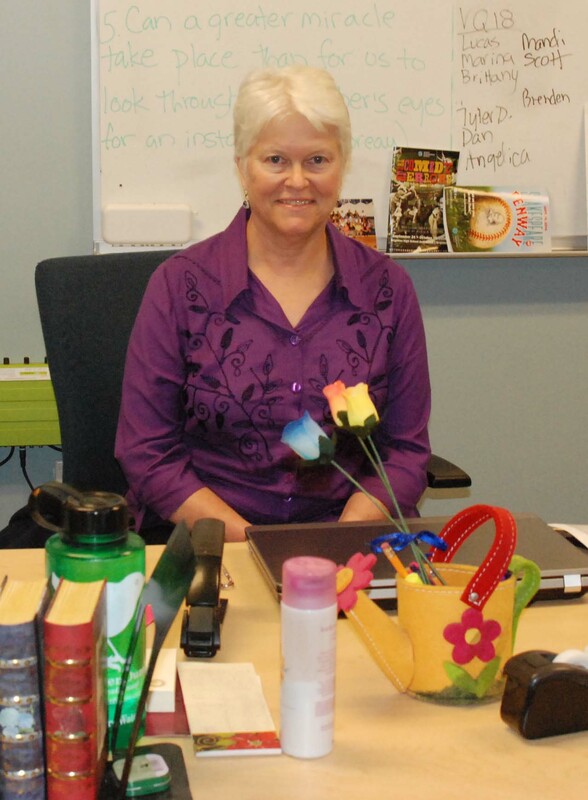 English teacher, Mrs. Amy Woodward will be missed when she retires on June 22. As the school year comes to an end, RHS students and teachers are looking forward to summer vacation to get the rest they need, so that they can begin another school year in a couple months. Two veteran staff, however, will be extending their vacations as they begin well deserved retirements. Special Education tutor, Mrs. Sandra Kowalski and English teacher, Mrs. Amy Woodward have decided this will be their last year here at RHS. 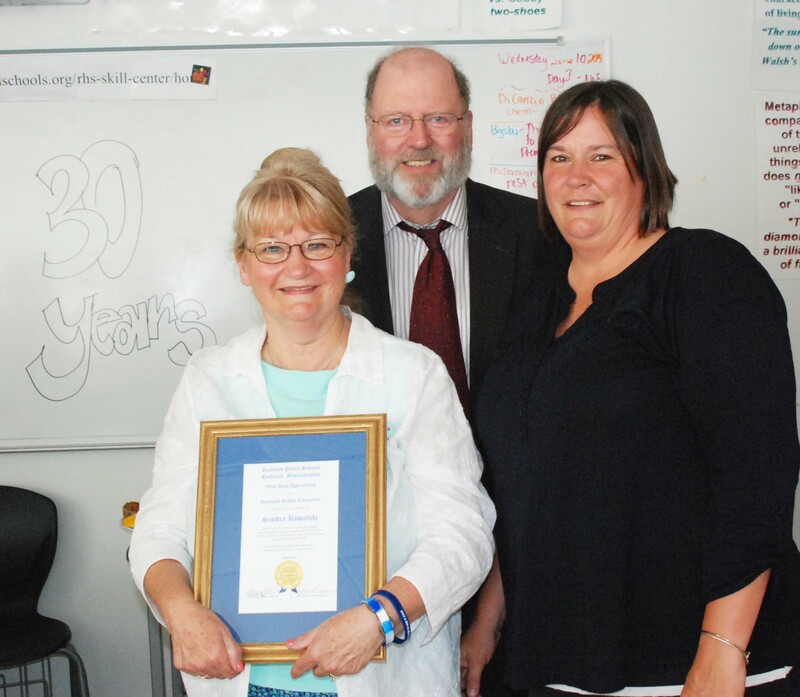 Mrs. K receives her 30 year plaque from Superintendent of Schools John Retchless and her department chair, Sharon McGonnigal. Mrs. Kowalski, known by her students and colleagues as “Special K,” works as a Special Education tutor, and works in a class with regular education teachers in English, math, history, and science. “Day after day I saw her devotion to teaching and her dedication to the students of RHS. She helped me in my early years here as much as she has helped her students!” Miss Cahill, English teacher at RHS said. Mrs. Woodward has been an English teacher at Rockland High School for fourteen years. “Aside from being an excellent English teacher she has organized our Poetry Out Loud competition for the past ten years and also did a fantastic job organizing the school wide Shakespeare Festivals,” Ms. Cahill said. Retiring has its ups and downs, but one of the ups is what life will bring you now that you’re free. “I am looking forward to the luxury of time: time to travel, to garden, to play my piano, to read, to be there for a relative or friend who needs my help,” Mrs. Woodward says. Spending more time with family is another perk of retirement. “We have a wonderful family which includes six granddaughters. We will have a lot more time to be with them,” Mrs. Kowalski says. “I will miss a lot of individuals, but the main thing I’ll miss is the daily company of young people, constantly challenging me to match their energy levels and see the world from their perspective,” Mrs. Woodward said. Mrs. Woodward’s students will miss her as well. As summer gets closer and the school year ends, the eighth graders are trying to prepare themselves for what’s to come as they enter high school. Making a big life change from middle school to high school can be hard for some. Adjusting to a new environment with older kids you do not know, and being the youngest in the school can be stressful for many students. Dealing with new situations can make people nervous. Despite the normal nervousness these three eighth graders Adiza Alasa, Danny Callahan, and Devin Tobin-Rosman feel ready to move into the high school. All of them agree that they are academically ready for high school and the experiences that are coming up in their lives. With not much time left as middle school students, these eighth graders appear to be ready for what is ahead of them in two and a half months. On Wednesday, June 3, the class officers for the 2015-2016 school year were announced. Each grade has a designated president, vice president, secretary, and treasurer who all play an important role in the running of class events, fundraisers, and other activities with the assistance of their class advisor. 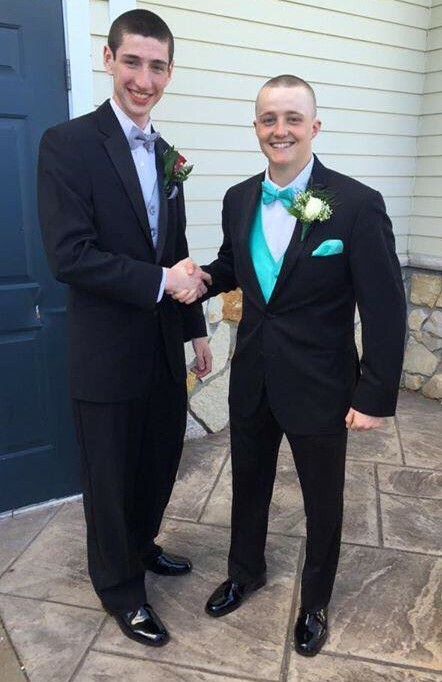 Senior class vice president, Matt Kirslis (left) and senior class president, Mike Ahern before the 2015 Junior Prom have already started plans for next year’s big event. This year, upcoming senior, Mike Ahern, will be President of the Class of 2016. He, along with his fellow officers, have a lot in mind for their class and are ensuring successful fundraisers and a memorable prom. Ahern and the Class of 2016 officers are hoping to decrease the cost of prom tickets by way of creative fundraisers and collaborative work amongst the senior class. “We are hoping to do about one fundraiser per month to maximize our profits for the year,” says Sean Carney who will be the Treasurer of the Class of 2016 for his fourth year. Other than working on plans for prom, Ahern is looking forward to some other aspects of the upcoming year. Upcoming junior, Kaylee Patten will be the President of the Class of 2017. Like Ahern and the seniors, Patten already has ideas for next year in the works. While making the transition from underclassmen to upperclassmen, Patten hopes to make the Class of 2017’s junior year memorable and involve her graduating class in activities to benefit her grade and the community. 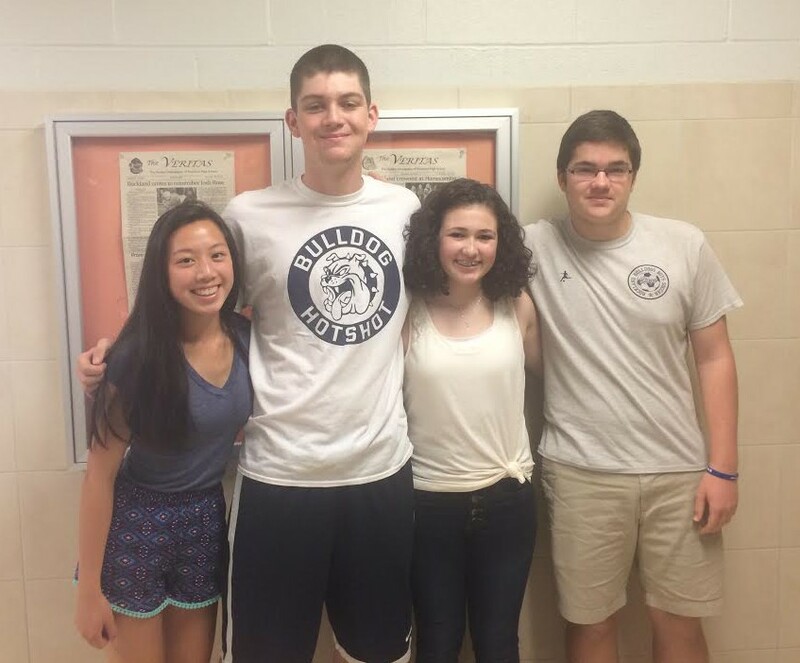 From left to right: Izzy Uong, Aiden Glennon, Macie Jones, and Sean Sugrue have ideas for fundraisers in the works. Re-elected Class of 2018 President, Aiden Glennon, with both a year of high school and a year of class officer experience under his belt, is getting ready to start off sophomore year strong. With help from his class officers, Glennon already has the first fundraiser for the Class of 2018 planned and ready to go for the upcoming school year. Haley Macray, Ryan Sugrue, Ashley Pezzella, Katie DeLorey, and PJ Butler at the 2014 RHS SGC Camp. The annual Rockland High School Student Government Council Camp will be held August 10, 11, and 12 from 9 a.m. to 1 p.m. each day. The camp, now an RHS SGC tradition, is held each year to prepare RHS students of all grades for the upcoming student government year. 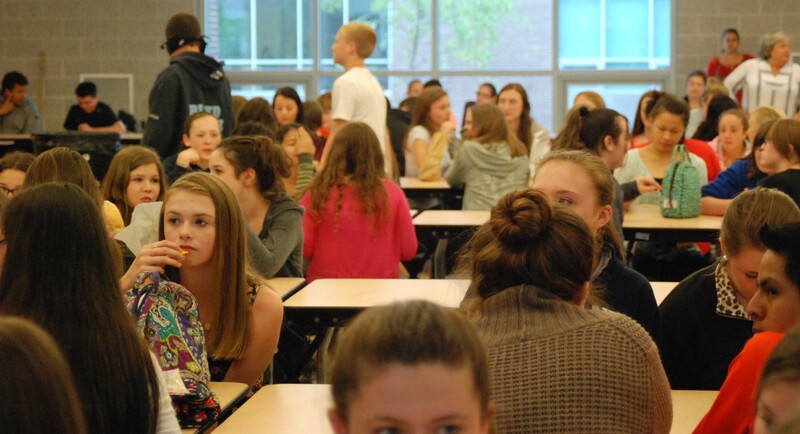 It allows incoming freshmen and students new to the school to interact with upperclassmen and become familiar with one of the high school’s most popular clubs. While at the camp SGC members participate in student-run workshops, games, and activities. On the final day of the camp, members divide up into four groups according to the committee they have been assigned to for the year and compete in a colors war themed day packed with scavenger hunts, relay races, and minute-to-win-it challenges. 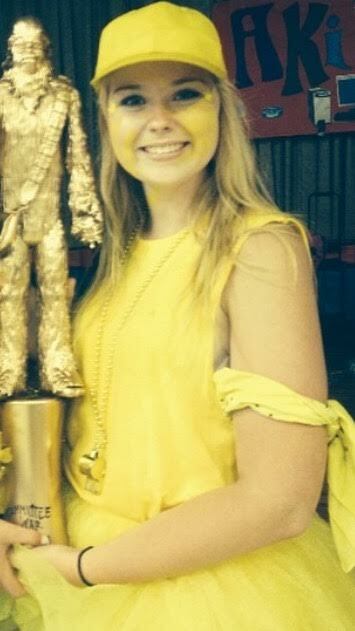 Upcoming senior Meghan Foster shows off the Committee Wars 1st place trophy at last year’s SGC Camp. As for this year’s camp? Macray has a lot of exciting surprises in store. Macray urges anyone interested to give SGC a try and sign up for camp. This year’s Executive Board and Big 5 made up of council officers, class presidents, committee chairs, and other representatives spend portions of their summer to make SGC Camp a successful three days filled with fun, laughs, and most importantly leadership. For those looking to attend this year’s camp. 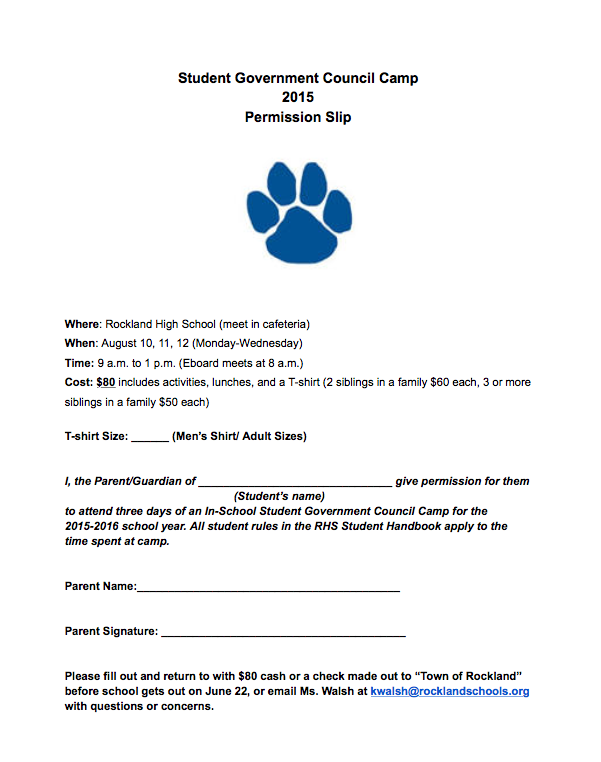 The below permission slip must be completed and returned to Head Council Advisor Kristen Walsh along with either $80 cash or a check made out to “Town of Rockland.” More information about the camp can be found below as well as pricing for families of two or more. The first annual Jared Lewis Quirk Memorial Speedball Tournament was held from June 3 to June 5 at Rockland High School. Speedball is a beloved game and tradition at Rockland High. Following the death of Jared Quirk in April, English teacher Kristen Walsh organized the tournament in his memory. She explained that RHS alumni Ryan Quirk, Jared’s brother, and his friends wanted to play speedball one more time. The tournament was also a fundraiser for the Jared Lewis Quirk Scholarship. The tournament involved ten different teams, made up of high school students, teachers, and alumni. Going into the highly-anticipated event, God’s Children, made up of six RHS seniors and one RHS junior, was the number one seed. Team NB led by Ryan Quirk, was the other favorite. 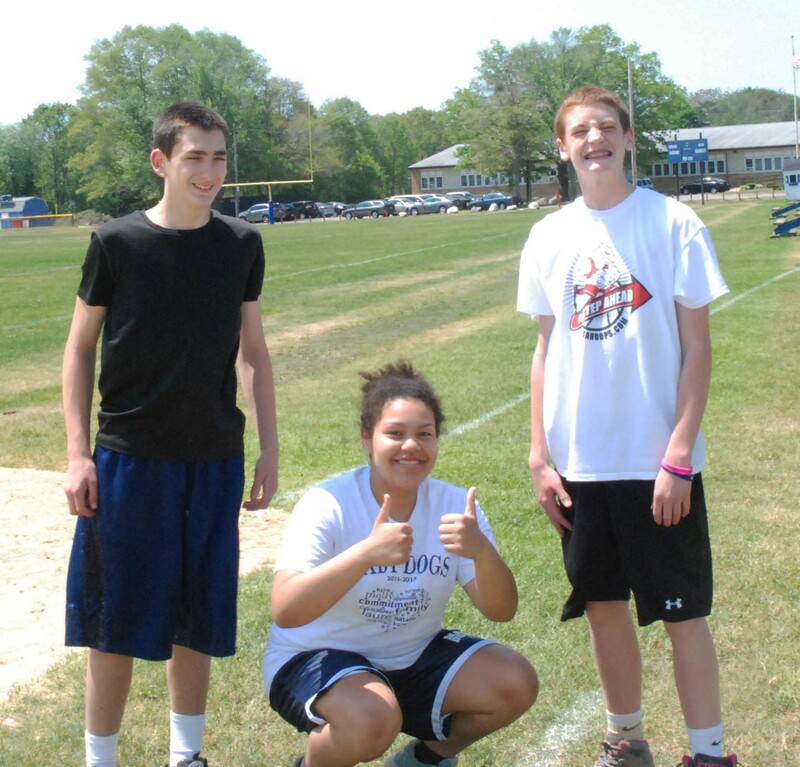 Team NB was made up of Rockland alumni, two of which are Division II college athletes. Quirk’s team even had a cast of cheerleaders routing them on in every game. Parents, friends, and fellow students, filed into the gym all three days of the tournament. Each game kept fans and supporters on the edge of their seats the entire time as the gym rocked with cheers. The championship was played on a warm Friday night and the game went until 9 o’clock, yet students stayed in the gym waiting to see which team would be crowned champions. The top seeds, Team NB and God’s Children, made it to the finals, but each team took a different road to the championship. Team NB had to play a handful of games the final day of the tournament, while God’s Children played a only a handful of games the entire tournament. This is because team NB lost early on and had to power their way through the entire losers’ bracket to reach the finals. God’s Children came into the finals undefeated, suffering their first loss of the season against team NB in the championship. Because the tournament is a two-game elimination, God’s Children and team NB had to battle through another championship game. The final game went into overtime and then into a shoot-out. After four misses by each team, God’s Children’s Justin Nguyen lasered a kick right by Team NB goaltender Aaron Ryan who had a tremendous tournament. With the championship on the line, Team NB captain Ryan Quirk had the game in his hands. He had to score or the game would be over. The gym was silent as Quirk approached the ball and fans were on the edge of their seats. Quirk kicked the ball just outside of the post and missed the net. God’s Children celebrated in victory, but Team NB took the loss well. Junior Harrison Shields was overjoyed as his team won the tournament that meant so much to him. Not only did the tournament provide a source of entertainment for fans, it also succeeded in raising funds. The Jared Lewis Quirk Speedball Tournament was a special event held in the town of Rockland. People who never had a desire to watch speedball really enjoyed it. Many people involved with the tournament will remember the event for its action-packed games, quick flashy goals, and tremendous split saves by goalies. However, everyone will also remember why the tournament was played and the reason why an abundance of people were packed into the gym on Wednesday, Thursday, and Friday nights. The town came together to support each other multiple times throughout this past year, but it was truly special that those closest to Jared could play and take part in the Jared Lewis Quirk Speedball Tournament. Action photos from the tournament were taken by Ryan Palmer, Brianna Starkey and Matt O’Brien. Ball is heading to the goal but it was wide. Matt Nicholson ready to shoot. Mr. Johnson looks to make a pass. Final Exams begin on Tuesday, June 16. RHS Principal, Dr. Cron has released the following schedule and guidelines. Just a reminder during a busy time that Final Exams at Rockland High School begin this Tuesday, June 16 and conclude Monday, June 22. Regular class sessions are suspended during this time. If a student is taking two exams in one day, he or she must arrive before 8:00 a.m. and remain in school until the conclusion of the second exam period at 2:15 p.m. If a student is scheduled for only one exam per day, you must arrive on time for that exam and may leave campus when the exam period is concluded. Throughout Final Exams, the library, cafeteria and computer lab in room 211 and 214 will be open for quiet study. Lunch will be served in the cafeteria from 10:45-11:45. * The last day of school, Monday, June 22, is a ½ day (make-up day) for students and a full day for faculty. Lunch will not be served on this day. Buses will run on the regular schedule throughout final exams. If you have further questions, please call the RHS general office at 781-871-0541 ext. 1103. The annual year end athletic awards ceremony was held on Tuesday, June 2. The top male and female senior athletes were recognized, celebrating their four years as Bulldogs. Several awards were given in honor of former coaches and athletes at Rockland High. The first annual Charles E. Leverone Memorial awards, given to the two top athletes in track or cross country, were presented to Kara Penney and Ian Welch. For all the award winners see list and photos below. Taylor Reis was presented with the John Bell Bulldog Award by her softball coach Sharon McGonnigal. Athletic Director Gary Graziano presented Natalie Ellard with the John Delorey Award. Mike Leavitt was presented the John Delorey Award by baseball coach Nick Liquori. Leshon Crawford received the Louis Cifello Award from Gary Graziano and Fred Damon. Lauren Farrell received the Vicki Solari Award from AD Gary Graziano. Dylan Bernache received the Joseph Dondero Award as a top scholar athlete. Brianna Starkey received the top female athlete award from softball coach Sharon McGonnigal. Ben McKenna and soccer coach Rich MacAllister. McKenna received the John Delorey Award. Andrew Frazer received the Robert Ellis Award for the top male basketball player, presented by basketball coach, Fred Damon. The first annual Charles E. Leverone Award was given in memory of long-time track and cross country coach who passed away this year. Kara Penney and Ian Welch were the recipients. They were joined by coaches Randall Grimmett and Robert Murphy and Leverone’s family including his sons, grandson and wife, Toni. Senior major award winners are back left to right: Taylor Reis, Natalie Ellard, Brianna Starkey, Lauren Farrell, Julia Matson, Kara Penney, Kallie Morss, Molly McDonough, Leshon Crawford. Front: Dennis McPeck, Mike Leavitt, Dylan Bernache, Andrew Frazer, Ian Welch, Ben McKenna, Matt Clougherty, Matt Ryan, Eddie Yeadon. Silver Bowl Winners: Eddie Yeadon, Matt Ryan, Dylan Bernache, Ian Welch and Julia Matson.